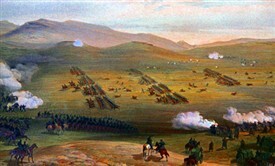 The Crimean War took place in 1854 – 1856, including the still-remembered Charge of the Light Brigade at the Battle of Balaklava (25 October 1854). By the turn of the 19th/20th Centuries survivors would have been in their 70s or 80s and newspapers often took note when they died, just as we have recently noted the passing of the last veterans of the 1914 – 18 War. One of the few remaining Crimean veterans was carried to God’s acre on Tuesday afternoon. The Rev. Blomefield, of St John’s , reading the words of prayer and consolation at the graveside. 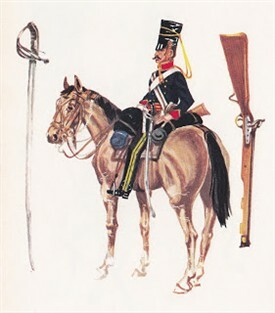 Private Thomas Leadbetter enlisted in the Scots Greys soon after the regiment had left Nottingham Barracks for the Crimea , and he was subsequently transferred to the Royal Artillery. He was at the capture of Sebastopol , and received medal and clasps for the campaign and another “good conduct” medal on leaving the army with a small pension. His age at death was 74, and Sergeant Dan Wade, R.A., another of our Crimean warriors, was among the little cortege which followed him to the cemetery grave on Tuesday. Mr. Leadbetter had of late years resided with his son-in-law, Mr. Brown, at Hazel Grove [Hucknall]. 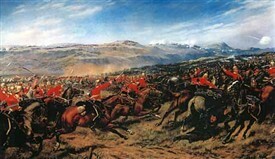 Unfortunately it looks as if Leadbetter had transferred to the Artillery before the Scots Greys were involved in the Charge of the Heavy Brigade at Balaklava, though casualties were high and he might not have survived had he still been a cavalry trooper. …Simultaneously the funeral of another army veteran – Thomas Francis – took place in Basford cemetery in the presence of a large and sympathetic assembly. Francis had had a noteworthy career, having taken part in campaigns in the Crimea , in China , in Syria , and in the Indian Mutiny, and was the proud owner of six medals and clasps. The first of these three was Daniel Deering, born in Ireland 1825, whose death aged 79 was registered in Nottingham in June 1904. He was living on an army pension in St Ann’s with his wife Hannah in the 1901 census. As the paper noted, he really was in the Charge of the Light Brigade. 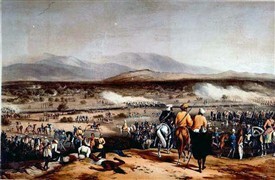 SUTTON WARRIOR WHO FOUGHT IN INDIA AND THE CRIMEA . The ranks of the Nottingham and Notts Crimean and Indian Mutiny Veterans were thinned on Monday by the death at Sutton-in-Ashfield of William Thompson. 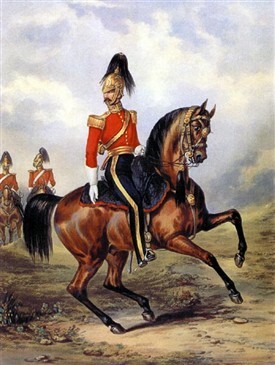 The deceased, who was born at Chesterfield on March 1st, 1824 , enlisted at Chesterfield in March, 1846, in the 3rd Light Dragoons and served under the Duke of Wellington . Thompson volunteered into the 1st Royals, in which he served in the Crimea, being present at Balaclava, Inkerman, and Sebastopol . He was discharged in 1866 at Aldershot. On the recommendation of Sir Charles Seely…a pension of ninepence per day for life was obtained, and the Nottingham and Notts. Crimean and Indian Mutiny Veterans’ Association has for years paid his rent. He leaves behind a widow. A beautiful piece of well-researched journalism, although he only ‘served under the Duke of Wellington’ in the sense that Wellington was Commander-in-Chief of the Army when he enlisted, never in the field. Three months before he died Thompson had been recorded in the census as ‘Oldage [sic] Pensioner’, living at 5 Little Duke Street, Sutton-in-Ashfield with his wife of 35 years, Ramie. They had no children. Unusually for the time, he was still illiterate and left X, his mark after someone else filled in the census form for him. Only a few weeks before his death he had attended a War Veterans' Dinner held to celebrate the Coronation of King George V at the Empress Rink in Nottingham on 20 June 1911. MILITARY HONOURS AT MANSFIELD FUNERAL. …the funeral took place at Mansfield Cemetery on Tuesday of a veteran of the Crimea and the Indian Mutiny, ex-Sergt. [William] Lacey, a native of Pleasley, who up to a year or two ago resided in Stockwell-gate. The old gentleman…served for many years in the cavalry, enlisting in 1855 in the 8th Royal Irish Dragoon Guards, a regiment which was annihilated almost to a man in the famous charge of the Light Brigade at Balaclava. He was trained with the 7th Hussars in York, and drafted out to the Crimea about the end of the same year, but arrived too late to take part in the fighting of that memorable campaign, for the Armistice was completed just as the troopship reached harbour… In 1857 at the time of the Indian Mutiny, Mr. Lacey volunteered to go with the 2nd Dragoon Guards to India, and was quartered at Cawnpore until after the fall of Lucknow, taking part in a couple of skirmishes with the enemy towards the close of the fighting… During his sojourn in India, Sergt. Lacey married a native girl, who bore him fifteen children, eleven of whom are still living. The couple celebrated their golden wedding in Mansfield in 1914, but Mrs. Lacey died four years later. By contrast with the 1911 obituary of Thompson, this is inaccurate in many ways. If he had died at 80, Lacey would have been born in 1843 and joined the army to go to the Crimea aged 12. Not impossible for a drummer-boy then, but in fact he had been born in 1837 and was 86 when he died. 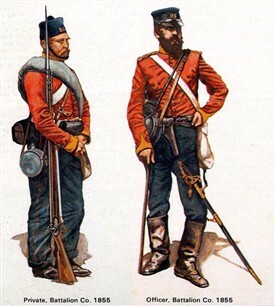 Nor was there any such unit as ‘the 8th Royal Irish Dragoon Guards’, though the 4th of that name were in the Heavy Brigade. Lacey's Indian wife appears in censuses as ‘Amelia Margaret’, perhaps an English version of her real Hindi name, though she may have been a Christian? 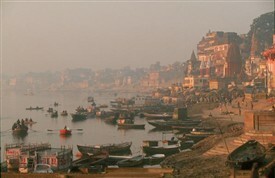 She was born in Benares, now known as Varanasi in Uttar Pradesh. In the 1891 census the eleven surviving children (of 12 born alive, not 15) were still living with them at 29 Stockwell Gate, plus a daughter-in-law and one grandchild. William and his second son, James, were both Insurance Agents; eldest daughter Mary, aged 21, (who was born in Chunar, Uttar Pradesh) and son, Joseph, were both ‘Working at Jam Factory’. Fred, a son of 14 was ‘Working at Sweet Factory’, though the rest were ‘Scholars’, except for the babies 2 month old Margaret and the 5 month old granddaughter, Rose Hannah. A remarkable multi-ethnic household of fourteen in Victorian Mansfield. This page was added by Ralph Lloyd-Jones on 07/08/2013. Thank you for the above Comment. We are very interested to hear about the book presented to Veterans in 1911. Would it be possible to have a scan of it to add to the Ournottinghamshire website? John Lakin of The Sherwood Foresters 45th & 95th, received two medals, Reg No. 1828. 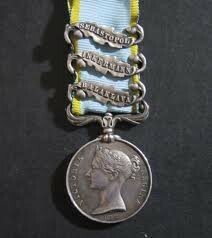 Description of Medals was Egyptian, Khedive's Star. This is taken from the The War Veterans Dinner 20 June 1911.